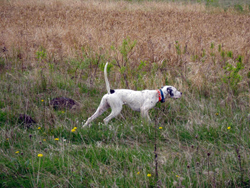 The English Pointer is an extremely athletic and graceful upland bird dog. The dog should be a compact, hard-driving hunting dog with what appears to be endless grace and energy. English Pointers are even-tempered, congenial dogs, and despite their large size, make good house pets so long as they get sufficient exercise due to their extremely high energy levels. English Pointers are intelligent, affectionate, clean and intensely loyal. Their aggression level is very low to non-existent and they normally happily coexist with other dogs and cats. 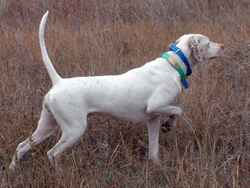 The English Pointer is a very talented upland bird dog with beautiful rock-hard points. However, retrieving is not their strong point nor is water. With the short coat the English Pointer is very low maintenance, but susceptible to cold weather. Additional breed information for the English Pointer can be found at the American Kennel Club website.